Using Window 3.0 with Novell Netware. The information can be applied to Windows 3.1 to successfully run windows on a netware environment. Good information contained in this document. Shared network installation accomplished via EXPALL.BAT. Setup /n to install UCFs. Setup /I avoids some problems with SETUP.EXE, and ARCNET, NICs set to IRQ 2, and/or I/O @ 2E0h. Load IPX, NETX, Login before running Windows. Don't logout from within Windows (set the prompt via batch file when shelling to DOS. connection behavior remains to be seen. Use same letter to map to shared windows drive. This is stored in several UCFs and other files. BINDFIX.EXE and BINDREST.EXE should be dated later than 10-30-89.
possible. Use VPICDA.386 if using INT > 9. Use current file revisions (IPX, NETX, VIPX, etc) whenever possible. Capture settings should include /NT, /A, TI=0. 2) Load all TSRs (including Rprinter) after NETX and before you go into Windows. 3) Try the NWWINFIX patch from Infinite Technologies, WINPRT.ZIP in NOVLIB Library 17. 5) Install windows on a local drive. 7) Exclude difficult addresses such as video ram and NIC I/O within the SYSTEM.INI file. 8) Avoid IRQ's 2, 9, or 3 when installing the NIC in the workstation. when the printer loses connection as seen at the Print Server's status screen. 12) Avoid other TSR's at the workstation using both RPRINTER and Windows. drastically effect network traffic if TEMP= points to a network directory! Fileman can map (even map root) net drives. KWIBBLE BBS, as well as the NOVLIB forum of CompuServe. These are all available now as part of the WINUP4.ZIP available on NETWIRE and may be updated this week. directory where your existing versions are located. 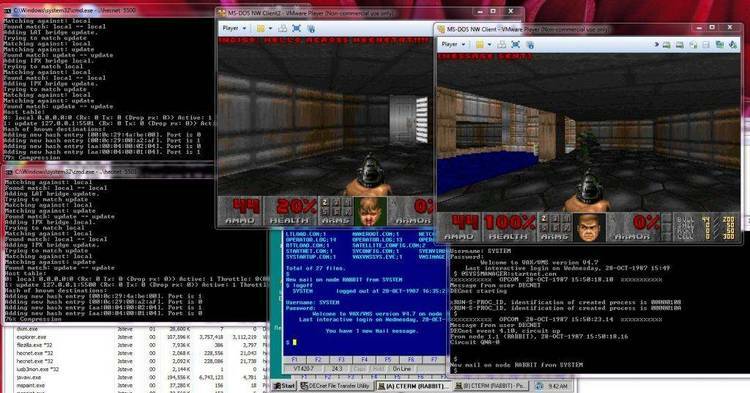 Windows or the MS-DOS 5.0 task switcher. of your SYSTEM.INI file to on. information about controlling the location of your swap file. Windows. Also, each instance of MS-DOS Prompt you start from Windows typically has its own set of drive mappings. server before the server runs out of available connections. command, the connection is removed for the current Windows session, but is reconnected when you restart Windows. running SETUP. A 25th line message while running SETUP will hang the workstation. loaded from your AUTOEXEC.BAT file, you should remove it manually. be made to startup files, and application related files (such as DLLs) are copied to the 3.0 directory. configuration, all Windows files are located in the users Windows directory or its subdirectories. directory can be either on the users hard disk, or on a network server. 386/16 w/8MB on Ethernet good). components installed, including a printer and network. Windows directory, or use it to install full or partial copies of the program, or both. 1 Insert the Windows version 3.1 disk #1 into a floppy disk disk drive. 2 At the MS-DOS prompt, type the drive letter of the floppy disk drive. 4 Follow the instructions on your screen. when individual workstations are set up. 1 Connect to the network. 2 Change to the directory where Windows is located on the network (for example, W:\PROGS\WIN31). personal Windows directory or server drive/directory (MAP ROOT the drive and directory beforehand). typing setup /n). You can run setup /n only if you are setting up Windows from a network server. even if a user specifies a different Setup option. (.GRP) files and initialization (.INI) files). All other Windows files are found in the shared network directory. you should expect to spend no more than 20-30 minutes to set up Windows. want users to be able to set up on their own workstations without having to make any system configuration choices. you are setting up Windows from a network drive or from the Windows Setup disks. where users have rights to open and read files, or copy it to the workstation disk. If you want to run a shared copy of Windows from the network, type setup /h:[drive:\path]filename /n. NOTE Some of the entries require values from the Windows SETUP.INF, CONTROL.INF, and WIN.INI files. that you can view with a text editor or print. change them before continuing with the Setup program. detected or default device will be used. automatically override the installed device. numbers found in the [novell.versions] section to specify the version of the shells you are setting up. language= Specify the language. Use one of the profile strings found in the [language] section of the SETUP.INF file. up. Use the vendor's OEMSETUP.INF as a template. Windows in the WINDOWS directory on drive C, specify c:\windows in this section. you are setting up a shared copy of Windows (setup /n). The second line specifies the company name, and is optional. copied Windows files to the server (setup /a). at the end of Setup. If you dont want any of these options, you can omit tis section. can use to choose which applications to set up in Program Manager groups. autosetupapps Automatically set up all applications found on the users hard disk. tutorial Start the Windows Tutorial at the end of Setup. If you don't want to install any printers during Setup, omit this section. endopt = exit Return to DOS on completion of Setup. endopt = restart Restart Windows on completion of Setup. Setup. After Windows is set up, Windows is restarted. modifying groups or running certain applications. Windows desktop; you do not need to modify this file if you want the default Windows configuration. brackets], with entries and settings under section headers. to add if you are updating Windows. updating and for new installations, add the group to both the [program.groups] section and the [new.groups] section. 1 Open the SETUP.INF file and find the group section where you want the application icon to appear. 2 Type the program title in double quotation marks (" ") followed by a comma (,) and then the application filename. want to specify a working directory for user files so that personal files dont remain in the shared application directory. You or a user can specify a working directory by modifying the Program Item Properties in Program Manager. a disk number in the [disks] section of the SETUP.INF file and then specify that disk number in the [net] section. the disk (used to determine if the disk is in the drive). For example, 7 =. , My Additional Disk , myapp.exe . setting up Windows from a network, specify the letter of the floppy for the path of the disk, for example, A:. description Network Application Settings appears on the screen while the file is being copied. manufacturer's OEMSETUP.INF file on their support diskettes. their particular display, pointing device, network, or other hardware devices. In the [io.device] section of the CONTROL.INF file, delete the entry for the printer you do not want to display. install a printer from Control Panel or change system settings by using the Setup program rom within Windows. The default entry is netsetup= false, which allows users to run any of the Setup options. gets copied during Setup will overwrite any existing PROGMAN.INI file in the users Windows directory. restrictions as you like, depending on the functionality you want users to be able to access. 1 Exit Windows and open the PROGMAN.INI file with a text editor that can save files as text (ASCII) files. 2 In the PROGMAN.INI file, add a [restrictions] section if one does not already exist. 3 In the [restrictions] section, specify any of the restrictions listed below. You can specify any of the following settings in the [restrictions] section of the PROGMAN.INI file. applications are set up as icons in a Program Manager group. be dimmed), or by using the ALT+F4 key combination. SaveSettings= entry in the [Settings] section of the PROGMAN.INI file. still quit Windows by using the Control menu or the ALT+F4 key combination. Copy, and Delete commands on the File menu are not available when a group is selected. specify this value, the New, Move, Copy, and Delete commands on the File Menu are not available at all. you specify this value, the text in the Command Line box in the Properties dialog box cannot be changed. dialog box, but all of the areas are dimmed. PROGMAN.INI file, or set the value to 0.
following entries in the [restrictions] section of the PROGMAN.INI file. users to start other applications, make sure you do not include them in Program Manager groups. when Windows is restarted, specify the following entries in the PROGMAN.INI file. rest of this section describes these two tasks. items in a shared group, but cannot change them. 1 Create a group file by using Program Manager to create a group and add program items to it. 2 Copy the group file (.GRP) to a shared network directory and mark it as read-only. Properties dialog box, specify the location and name of the group file in the shared network directory. group called my desktop would be started. You can specify any string for name. If you leave the string blank, no group will be used as the Startup group. the WIN.INI file, they will be run and/or loaded before the programs specified in the Startup group. and 1 megabyte and a user has problems running Windows, try loading the network in conventional memory. preserved when you move or copy files with long filenames. (3.1) files for this information. combination of letters and digits in uppercase or lowercase, and it must be followed immediately by an equal sign (=). Boolean setting, you can set the value to: False, No, Off, or 0. There are multiple settings in most sections. changes to the setting on another line. See the sample above for an example. Any changes you make to SYSTEM.INI settings do not take effect until you restart Windows. file to before changing or upgrading a modified configuration. from using a portion of memory between 640K and 1 MB to map unused address space. 1 Find the [386enh] section of the SYSTEM.INI file. 3 Save your SYSTEM.INI file and restart Windows. buffer for transferring data over the network. but more users should be able to access Windows from a single server. 1 Find the [boot] section in the SYSTEM.INI file. 2 Specify FileSysChange=no in this section. application at a time receives timer interrupts. 3 Save the SYSTEM.INI file and restart Windows. Note: Using the TimerCriticalSection entry may slow down Windows. NetWare and Microsoft Windows Integration: Novell Appnotes January, 1991.
with a simple mouse click. Contact Aleph Systems, 7319 Willow Avenue, Takoma Park, MD 20912, 202-233-7865. 1-800-848-8199 and ask for operator 230. If you are already a CompuServe member, type GO MICROSOFT at any ! For information about the training center nearest you, call Microsoft End-User Sales and Service at 1-800-426-9400. Referral Specialist at 1-800-227-4679, extension 56042. * Portions of this document was excerpted from the Microsoft 3.1 documentation.